Even though the concept of piriformis syndrome (PS) was proposed eight decades ago,1 the existence of PS is still controversial. 2,3 The diagnosis of PS is based on knowledge of anatomy, clinical findings and anecdote, rather than firm evidence. The fuzzy criteria for diagnosing PS have made it difficult to perform randomized double- blind studies on this syndrome. So, there is little evidence available regarding the best methods to diagnose and treat it. In spite of the lack of evidence, there are plenty of assumptions, speculations and treatment protocols proposed for this malady. The piriformis is a flat, pear-shaped (literal translation from Latin: piri-pear, formis-shape) muscle that originates on the anterior sacrum and the sacrotuberous ligament. From its origin on the pelvis, it passes through the sciatic notch and inserts into the greater trochanter of the femur. The sciatic nerve passes between the piriformis and the ilium. The proposed theory is that a taut or anomalous piriformis will compress the sciatic nerve and cause sciatic neuralgia that may mimic disc-related sciatica. Myofascial manipulation, therapeutic modalities, ergonomic modification and stretching (Figure 3) have been recommended by a host of lecturers, authors and clinicians as the treatment of this spectral diagnosis. Variations in the anatomy of the sciatic nerve and piriformis exist7 but are not necessarily related to being symptomatic. No practical laboratory, radiographic or electrodiagnostic tests are recommended for PS at this time. Therefore, diagnosis is based on clinical observations and history. The diagnosis of PS should be made after excluding other sources of sciatic pain. First, look to the spine for causation of sciatica, then to non-nerve root compression causes. Differential diagnosis for non-nerve root compression sciatica should also include gynecological disorders, space-occupying lesions and myofascial entrapments (such as PS). Since spinal conditions are a more common source of sciatica than piriformis syndrome, the practitioner should avoid treatments that could provoke spinal sources of sciatica (e.g., spinal flexion and axial compression). The patient should likewise avoid any motion or activity that provokes or peripheralizes the sciatica. A host of authors recommend treatments that include myofascial release, stretching, massage, ergonomics and trigger-point modalities. 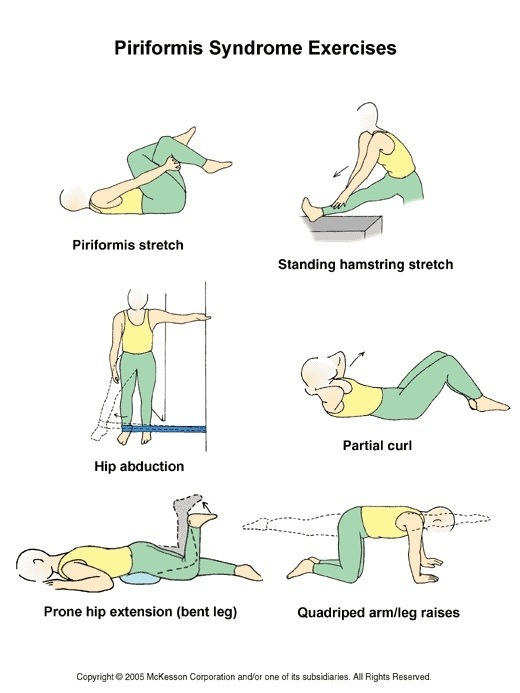 Below we have highlighted a few key stretching and strengthening exercises that can help alleviate at tight/weak Piriformis. As stated above, nerve root compromise, not piriformis syndrome, is responsible for most cases of sciatic neuralgia. Clinicians should not cling to the diagnosis of PS so closely that they become blinded to more probable sources of sciatic neuralgia. Just because a patient has sciatica and tenderness near the site of the piriformis or the doctor believes he or she feels a tightness or trigger point in the piriformis, it does not indicate that the patient has PS. Even though PS is less common than other types of sciatic neuralgia, it is reasonable to believe that entrapment along the length of the sciatic nerve may be possible. Treatment protocols for PS may be beneficial for a subset of patients with buttocks pain and sciatica absent other probable causes. 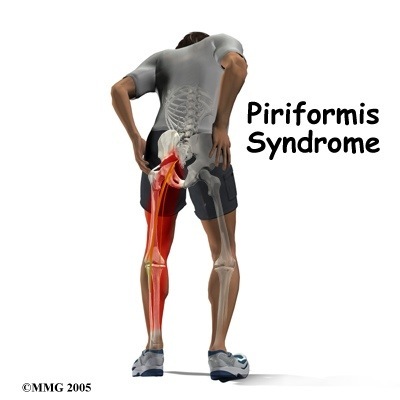 Does piriformis syndrome exist? A better question would be: Is piriformis syndrome over-diagnosed? Dr. Morgan shares his clinical time at a hospital- based chiropractic clinic and two Washington, D.C., executive health clinics. He is adjunct faculty for F. Edward Hébert School of Medicine, Uniformed Services University of the Health Sciences and New York College of Chiropractic. He can be reached through his Web site, www.drmorgan. info. (1) Yeoman W. The relation of arthritis of the sacroiliac joint to sciatica. Lancet. 1928;ii:1119-22. (2) Stewart JD. The piriformis syndrome is over diagnosed. Muscle Nerve. 2003 Nov; 28(5):644-6. (5) Yoshimoto M, Kawaguchi S, Takebayashi T, et al. Diagnostic features of sciatica without lumbar nerve root compression. J Spinal Disord Tech. Jul 2009;22(5):328-33. (6) Fishman LM, Dombi GW, Michaelsen C, et al. Piriformis syndrome: Diagnosis, treatment, and outcome — a 10-year study. Arch Phys Med Rehabil. 2002; 83:295-301.